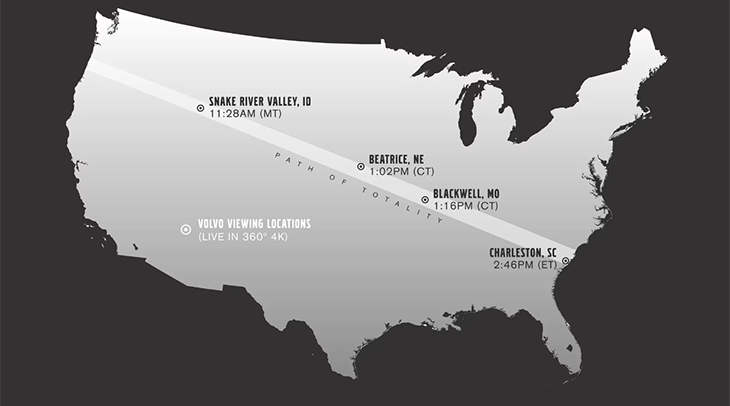 For the first time in nearly a century, the United States will have a front-row seat to a total solar eclipse, and starry-eyed television networks have launched a slew of marketing campaigns and branding partnerships to help viewers experience the celestial event. Monday, August 21, marks the first total solar eclipse since 1979, and the first to cross the U.S. since 1918. It will pass through 14 states, starting at 10 a.m. PDT in Oregon. A lunar shadow 73 miles wide will take one hour and 33 minutes to travel to South Carolina. Everyone in the continental U.S. will have the opportunity to see at least a partial eclipse, with 90 minutes of continuous observation—possibly making it the most widely viewed eclipse of all time in America. “The 2017 eclipse is a once-in-a-lifetime experience. It’s amazing to think that when the last solar eclipse crossed the United States coast to coast, an artist’s painting or perhaps a photograph was the best way to share it,” said Bob Jacobs, vice president of marketing, product and brand communication for Volvo Car USA. CNN teamed up with the car company to livestream Monday’s eclipse in 4K virtual reality from locations along the path of totality as it stretches across the country. “In anticipation of this historic natural event, CNN and Volvo have partnered to bring the public unique access through a never-before-attempted execution,” said Michal Shapira, senior vice president of news content partnerships, Turner Ignite. CNN’s Eclipse of the Century will use cameras optimized for low-light conditions to capture seven total eclipse moments as the phenomenon traverses along the path. Hosted by CNN Space and Science Correspondent Rachel Crane and former NASA astronaut Mark Kelly, the live show will feature real-time graphics, close-up views of the sun, and scientific experts explaining the significance of the astronomical event. The two-hour live stream will start at 1 p.m. ET on August 21, and will be available at CNN.com/eclipse, CNN’s mobile apps, Samsung Gear VR powered by Oculus via Samsung VR, Oculus Rift via Oculus Video and through CNN’s Facebook page via Facebook Live 360. While the 360° cameras available on the XC60 are different than the cameras that will be used to stream the eclipse, the synergy highlights the vehicle’s technology, CNN says. When the CNN live-stream moves to commercial breaks, live-branded content for Volvo produced by CNN’s brand studio Courageous will run in 4K VR and 360 degrees, and will be labeled “content by Volvo” to maintain transparency, according to the network. The four influencers who will offer their perspectives and commentary for Volvo are Explorers Club President Richard Wiese, “The Martian” author Andy Weir, egyptologist Kara Cooney and retired astronaut Cady Coleman. The live ad demonstrates how emerging technology will allow people to experience the eclipse as if they were actually there, Jacobs said. And CNN is not the only one leveraging advances in technology to showcase the spectacle. The Weather Channel also plans to capture the event the through live programming by stationing meteorologists from coast to coast—and beyond. Starting at 6 a.m., coverage will include views from sea with Royal Caribbean, and perspectives from an Alaska Airlines flight that will follow the eclipse at 35,000 feet. The channel will also use augmented-reality and mixed-reality technology for an in-depth look at the planets, moon and sun. 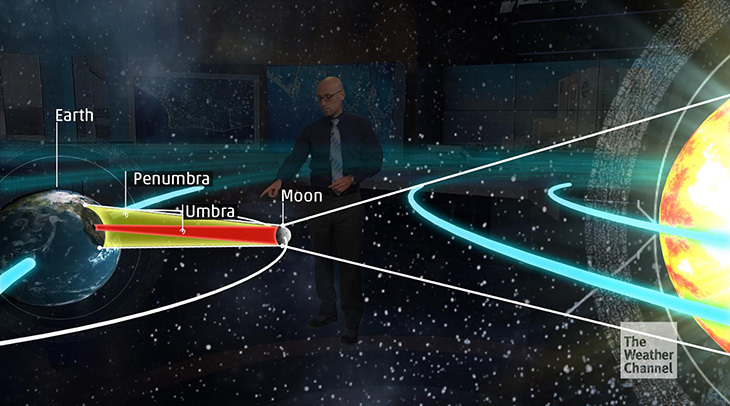 From augmented reality renderings of the umbra to the penumbra, orbits, and the path of totality, experts will offer a informative look behind the science of an eclipse. With mixed-reality technology that uses dramatic shots and 3D graphics, the channel will also take viewers through the beginning, middle and end of the entire experience in just a few minutes. During its live programming, Weather Channel experts will provide up-to-the-minute forecasts and show how current weather conditions, such as cloud density and rain, may impact eclipse visibility across the country. Additional live content will be pulled from telescopes, cameras, and viewers at home. From user-generated social media content, to dialing people in via Skype calls, The Weather Channel plans to show how people across the country are marking this moment in history. And leading up to Monday, The Weather Channel is also airing an Official Countdown to the Total Solar Eclipse, presented by DISH. Discovery’s Science Channel will turn an eye to the sky for its one-hour special The Great American Eclipse, which will include same-day live footage as producers work with a team of scientists to capture the event. “It’s pretty awe-inspiring to stand in the shadow of the moon,” said James Bullock, professor and chair of the physics and astronomy department at the University of California at Irvine, at the Television Critic’s Association summer press tour. He will take advantage of this window to study atmospheric changes and black holes, and hopes the event resonates with young viewers who will become the scientists of the future. “We have the chance for a whole generation of kids to be inspired by this physical astronomical event. It’s not happening in a video game, but in the real world around them,” he said. Science Channel also launched an eclipse micro-site full of blog posts, photo galleries and an eclipse companion guide video series. MTV is celebrating the eclipse from the ground with a series of activations that tie into the start of the Video Music Awards on August 27, and celebrates the network’s newly re-named gender-neutral “Moon Person” statue. In Charleston, Chicago, Kansas City, Los Angeles, Nashville, New York and St. Louis, the network has partnered with Fooji to deliver custom VMA eclipse viewing glasses and astronaut-themed ice cream to fans who tweet #TotalEclipseVMA along with the female-astronaut emoji. The campaign begins at 11 a.m. ET, 10 a.m. CT and 9 a.m. PT on the @VMA Twitter account. MTV will also give away eclipse glasses live on air to fans in Times Square. PBS will take to social media for a Facebook Live event hosted by PBS Science Correspondent Miles O’Brien and featuring commentary from experts watching the eclipse just outside Irwin, Idaho, along the path of totality. Through a partnership with Nova and PBS’ Newshour, astrophysicist Jason Kalirai from the Space Telescope Science Institute, along with others gathered at the site, will weigh in with their expertise on the eclipse. Later that same day, at 9 p.m. PBS will release Nova’s hourlong documentary Eclipse Over America, which will mark the science series’ most extensive fast-turnaround film to date. The documentary will include history of eclipse science and follow teams working on the forefront of solar science, incorporating immersive CGI animations of the sun’s mechanisms, sequences of the eclipse itself, NASA footage and more. Nova will also collaborate with several local public television stations along the path of totality, who will provide footage shot in their own backyards. Eclipse Over America will be available to stream the morning after broadcast on all station-branded PBS platforms, including PBS.org and PBS apps. Viewers can also visit the Nova Sun Lab, a web-based interactive site designed for teens where users can explore solar weather using the same data, images and tools that scientists use to track and predict solar activity.